The nerve supply to the oral cavity, masticatory muscles, and parts of the face is provided by the three-part nerve, the trigeminalnerve. This paired nerve emerges from the medulla oblongata and is the fifth cranial nerve. It carries sensory fibers (sensory root, radix sensoria, portio major) to the facial skin, the mucous membranes of the mouth, the nasal cavity, and the paranasal sinuses, as well as sensory fibers to the conjunctiva of the eye and to the lacrimal glands. In addition, sensory nerves of taste from the anterior area of the tongue to the brain are carried in the trigeminal nerve. The trigeminal nerve also carries motor fibers (motor root, radix motoria, portio minor) to the muscles of mastication and thereby regulates the movement of the mandible. 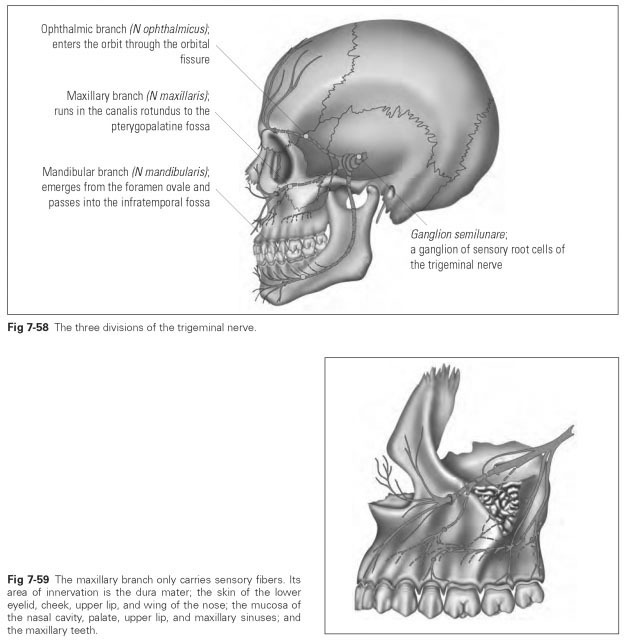 The trigeminal nerve consists of three branches that pass through separate openings in the middle cranial fossa into the adjacent cavities of the facial skeleton, where they again divide into three terminal branches (Fig 7-58). The root cells of the nerve form a powerful ganglion (ganglion semi-lunare, trigeminal ganglion, gasserian ganglion) in the middle cranial fossa in front of the apex of the petrous bone, where the ganglia create an impression in the bone (trigeminal impression). The lacrimal nerve (nervus lacrimalis) runs laterally to the lacrimal gland, the corner of the eye, and the eyelids. The frontal nerve (nervus frontalis) runs from the superior edge of the orbit over the forehead to the crown of the head; consequently, it supplies the skin of the root of the nose, the forehead, and the upper eyelid. The nasociliary nerve (nervus nasociliaris) runs centrally to the inner corner of the eye, the outer skin of the nose as far as the tip of the nose, and to the upper nasal mucosa. The zygomatic nerve (nervus zygomaticus) runs from the inferior orbital fissure into the side wall of the orbit to reach the skin of the cheek and the temple area through bony channels in the zygomatic bone. The infraorbital nerve (nervus infraorbitalis) runs straight and forward from the foramen rotundum to the infraorbital groove and into the infraorbital canal, to exit at the infraorbital foramen. Before it enters the infraorbital groove, a few fibers branch off to enter the infratemporal surface in the body of the maxilla, where they supply the posterior teeth and the gingiva. In the floor of the groove and the canal, a few fibers of the nerve pass through to the premolars and the anterior teeth of the maxilla. After exiting from the infraorbital foramen, the nerves run to the conjunctiva, the upper lip, and the wing of the nose. The pterygopalatine nerve (or sphenopalatine branch) passes through the sphenopalatine foramen into the nasal cavity and runs through the greater and lesser palatine foramina to the palate. It supplies the nasal mucosa and the mucous membrane of the palate as far as the anterior area. The mandibular branch (nervus mandibularis) is the third division of the trigeminal nerve, which enters through the foramen ovale into the infratemporal fossa. It is the thickest of the three trigeminal divisions and contains, as well as a proportion of sensory fibers, all the motor fibers of the trigeminal nerve with which the individual masticatory muscles are supplied (Fig 7-60). The auriculotemporal nerve (nervus auriculo-temporalis) supplies the parotid gland. The inferior alveolar nerve (nervus alveolaris inferior) supplies the mandibular teeth, the gingiva, and the skin of the chin and lower lip; passes through the mandibular foramen into the mandibular canal; and partly emerges again at the mental foramen. The lingual nerve (nervus lingualis) runs to the lateral margin and anterior part of the tongue with a few taste fibers, to the sublingual salivary gland, to the oropharyngeal isthmus with the tonsils, to the mucosa of the floor of the mouth, and to the gingiva.